The first thing IMT/SocialPoint did was ask CompTIA who their attendees were, what they wanted from education and what was important to them. CompTIA needed to deliver two full days of content, on one platform, with two channels playing simultaneously and to distinctly different audiences: business attendees and technical attendees. Engagement Tools: We provided a mix of tools for speakers to use to engage both online and onsite attendees. Speakers had the option of offering session polls and surveys with real time responses displayed for both audiences. We also encouraged speakers to submit at least 3 discussion questions to increase audience interaction. The engagement tools offered speakers a way to connect with 1,000’s of attendees from across the globe. The trivia game focused on hot industry topics and content delivered in the educational sessions. Not only was this entertaining but it reinforced the main educational concepts we wanted to highlight. We also displayed a Leaderboard with the top 20 winners worldwide which provided friendly competition. The mix of tools ascertained we were not just recruiting attendees but retaining them year after year. Continuous Programming: One of the main goals is for attendees to remain interested and logged in long-term. To accomplish this, we delivered content based on attendee profiles. When one session ended, another one began immediately. We had a back-up in place for sessions that ended early. We had short videos or triggered the trivia game to provide a constant flow of information and entertainment, ensuring an optimal viewing and learning experience. Exclusive Content. We created a studio program which included exclusive content with a host that guided attendees through both days. The host provided commentary on keynote sessions and conducted interviews with executive staff and presenters after the educational sessions. Having a “familiar” face deliver constant information, explanation and conversation keeps the audience updated and energized for what’s coming next. CompTIA also developed pre-recorded, commercial-type videos and slide shows that played during the breaks and between sessions to ensure a smooth delivery of consistent information, without static or blank screens for the online viewers. Content Channels: The content was organized into two channels based on the attendee profiles. When one session ended, a feedback form was prompted while we loaded the next session behind the scenes. This prevented potential frustration from attendees having to search for what session to watch and where to access it. There was a technical track and a business track, making it simple for attendees to find what they were looking for. Pulling off a successful online event takes a village. Integrating it into your organization requires obtaining buy-in at all levels of your organization: Education, Meeting Logistics and Marketing take on the most important roles in successful online event execution. Content is planned around the interests of audience profiles. Educational topics are confirmed months in advance and then the studio show and exclusive content are built around the educational sessions. Continuing Education Credits (CEU) proved to be a large draw for getting people to log on. However, the educational sessions had to remain intriguing or people would not stay. During the sessions, we have staff that monitor discussion forums and continuously add topics that encourage interaction. he greatest number of responses come from questions that hit attendees’ frustration, fear or bragging buttons. Attendees build positive camaraderie when they have a forum where peers post recommendations for common problems and share solutions with each other. Support CompTIA has phone and email support staff who manage inquiries from registrants and attendees. CompTIA prepares for the influx of questions that revolve around two main areas: technical support (browser issues, slow connectivity, log-in issues) and CEU-related questions (what sessions qualify, how to apply credits online, etc.). There are two CompTIA staff dedicated to responding to 1000’s of questions that come in those two days. FAQ sheets and standard response emails are created for them to send rapid replies. Creating a plan to handle large amounts of questions ensures a great customer experience and is key to high satisfaction scores in post event surveys. Q&A Moderators Each room has an assigned moderator with an iPad queued for each session. The moderator is responsible for capturing the online audience questions and asking them in the room for the onsite speaker and audience to hear. There are between 300 and 400 questions asked each year. A webinar-based training session is delivered a week prior to the live event for all speakers and the staff moderating Q/A so everyone knows how to use the tools most efficiently. 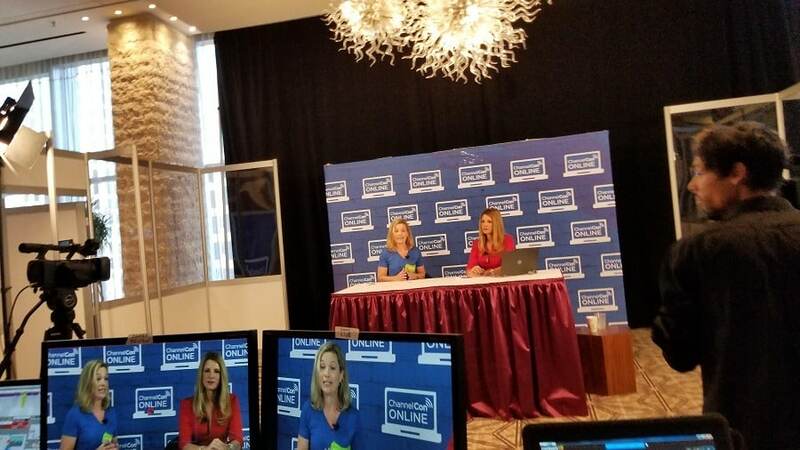 Technical Operations CompTIA uses Mediasite and SocialPoint to deliver their livestream. Mediasite is used for content capture and livestreaming. The SocialPoint platform wraps the Mediasite player in a branded portal that delivers content, manages log-ins, measures audience engagement (speaker Q&A, polling, discussion, and trivia game) and tracks CEU eligibility and credits. Marketing provides the platform branding and graphics. The event marketing plan includes the creation and deployment of event invitations inclusive of instructions for logging in, where to go for assistance, CEU (continuing education units) information, highlights of the agenda, sessions and speakers. It also includes subsequent reminder emails for potential and current registrants. The final reminder right before the event begins is crucial as it previous reminders often get lost or buried. The final reminder includes the link and log in details in the beginning of the email. This ensures anyone who wants to get on quickly has everything need right in front of them. It is also beneficial to attach an FAQ page with tips for avoiding browser issues, details on using engagement tools such as discussion questions, polling, the trivia game (include information on prizes), etc. The social media plan is also imperative for pushing out key messaging before the event, posting live footage and quotes during the event and providing information on how to access archives and resources post event. ChannelCon Online attendance has grown considerably since it first began. The event started with 300 attendees and has soared to over 4,000 attendees in just 4 years. Each year we add something new so the platform remains fresh and engages attendees that are new or returning year after year. This year, the new feature we added was an online trivia game that could be played during breaks. It also served as our Plan B. If sessions ran shorter than expected, we triggered the game to play, keeping attendees informed and entertained. The onsite attendees were also able to play on iPads displayed in prominent areas (near registration and designated member areas). Over 1,500 attendees played more than 3,500 SocialPoint games and answered over 55,000 questions! 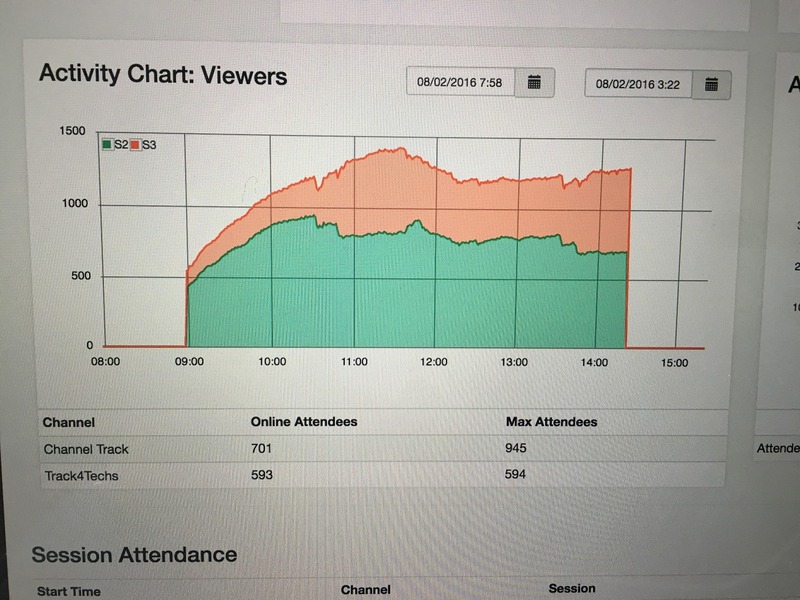 This was a screen shot of the analytics dashboard showing online attendee counts throughout the event for both session tracks. Establish a marketing plan inclusive of a strong social media campaign. Integrate audience engagement activities such as discussion questions, polling and a trivia game.